Peter Mafany Musonge, President of the National Commission for the Promotion of Bilingualism and Multiculturalism. The National Commission for the Promotion of Bilingualism and Multiculturalism was created at the peak and as one of the solutions to the socio-political crisis rocking the North West and South West Regions. What has been the contribution of the Commission in resolving the crisis? 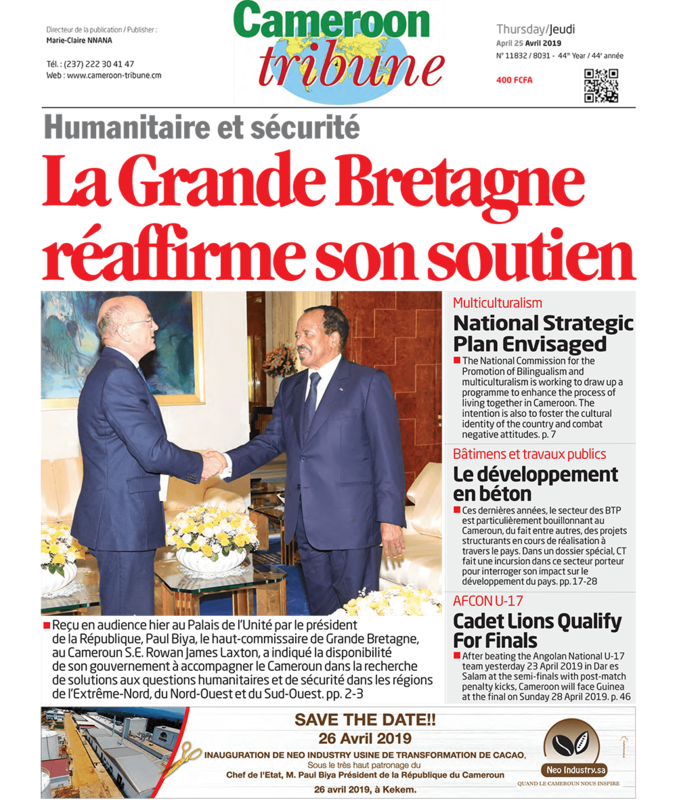 Since the creation of the Commission just over one year ago, it has been to the field to assess and address one of the areas of concern in this crisis, namely the equal regard for the two official languages in Cameroon. That exercise took the Commission to all the 37 ministerial departments in Yaounde where policy application starts in the central services and spreads out. The non-respect of the equal status of English and French as the two official languages of Cameroon as stipulated in the constitution of the country breeds bad blood, which spills over in different ways. We evaluated the practice of both official languages in those ministries and where there were shortcomings, we told the ministries concerned to respect the equality of both languages in the conduct of official business. That means, in the way they receive users, especially Anglophone users, how they publish official texts and treat official correspondence, and to take into account the bilingual nature of Cameroon when conducting recruitments into the public service, admissions into public professional schools, and in making appointments to posts of responsibility in public establishments. We made direct recommendations to heads of ministerial departments and later submitted strong proposals to the Head of State on what we thought government should do to ameliorate the situation. We are glad to note that the Head of State has acted by giving firm instructions to the Prime Minister on the scrupulous respect and practice of bilingualism in all public circles. So, you see, the message is sinking and things are happening. One of the missions of the Commission is to contribute to building peace in Cameroon through promoting living together by all Cameroonians. What have you achieved so far? The issue of peace building presupposes that you solve problems from their root causes. I have just indicated one of the vexing issues, namely the respect and practice of bilingualism in the country, which the English-speaking compatriots think is applied in a lopsided manner. We have gone out to all the 37 ministerial departments to evaluate how it is being implemented. At the end of the exercise, we recommended the best way it can be addressed for the good of all. Right now, almost all ministries are sending their staff to bilingual training centres to learn or improve knowledge of their second official language, and many state corporations now have installed services or committees to promote bilingualism, multiculturalism and living together. Many public officials now speak both official languages in public ceremonies and within their services. Peace-building needs actions that reassure and are sustainable. The Head of State has given firm instructions to the Prime Minister on the issue of bilingualism following our well-thought-out recommendations. We have to watch and acknowledge their ultimate outcomes. Peace-building also presupposes building confidence. What we do surely instills confidence in the public and gives assurance that things are changing for the better. For example, we have already started registering petitions from some members of the public on cases of marginalization and discrimination on grounds of language or culture. We have duly drawn the attention of the concerned public establishments to the said petitions and expect that they would act accordingly. While all of this is going on, we appeal for peace and serenity, some patience and an honest appreciation of the full measure of what is being done, as well as what is in the pipeline. Step-by-step we are making strides. Rome was not built in a day. The Commission members have left the air-conditioned offices in Yaounde to embark on the tour of the 10 regions of Cameroon. What did you tell the South West population during the first lap of the tour in Buea and what did you bring back? That is a double-barrel question. First, what did we tell the people of the South West region? We stressed the role of the Commission in the promotion of bilingualism, multiculturalism and living together with a view to maintaining peace and consolidating national unity. We recounted the many measures the Head of State has taken to address the vexing issues that sparked off the ongoing crisis. Reforms and measures have been carried out in the courts, universities, special admissions into ENAM, special recruitment of 1000 teachers of English-language expression, appointment of an Anglophone to head the judicial Bench of the Supreme Court, the creation of a Common-law section at the Supreme Court, appointment of Anglophones to strategic and coveted ministries like Territorial Administration and Secondary Education, etc. We also raised their awareness on the importance of national unity and living together as essential ingredients in making Cameroon a country where it is good to live. These factors also make the country welcoming and attractive to tourists and investors. Now, the second part of your question was about what we brought back from the South West mission. We brought back a basketful of opinions and proposals on how we can strengthen our bilingualism, reinforce multiculturalism, and make living together a permanent reality, as well as a catalogue of sound proposals on how we can come out of the present impasse in the country. We have faithfully forwarded them to the Head of State. The people of the South West were also happy with the existence of the Commission and that we came to meet them on the spot to listen to their viewpoints. They told us they are expecting much from the Commission. So, one more thing we brought back is the assurance of their ownership of the Commission. After South West, which region will follow in the nationwide tour and why? We are seriously working on that. We will make a definite statement on our next destination based on the reports we will get from teams we have already sent on exploratory missions to the various regions. You can be sure that objective reasons will inform the ultimate choice of our next move. After one year of existence, what is the plan of action of the Commission to especially consolidate peace in Cameroon within the framework of its missions? Good question. When we end the tour of the regions to listen to the people, we shall continue strategic monitoring of what transpires in the three areas of our mission, so as to regularly inform the Head of State on them. That would enable him pre-empt certain happenings before they occur, or give appropriate solutions when they do occur. Furthermore, we would embark on missions to foreign countries where, through benchmarking, we can perfect our work and fulfill our missions. Eventually, we shall also prepare a National Strategic Plan for the Promotion of Bilingualism, Multiculturalism and Living Together. In the same vein, we will propose draft instruments to strengthen bilingualism, multiculturalism and living together in Cameroon. Thank you for the opportunity Cameron Tribune has given me to explain some of our actions and perspectives on the eve of our national day, which celebrates our bilingual heritage and oneness as a nation. We pray that everyone would uphold and foster these values which have always made our country distinct and attractive in Africa.